the occasional national referendum, such as whether to change the form of government back to a monarchy (cf. Alma 2:7), or deciding whether and where to allow the people of Ammon (Anti-Nephi-Lehis) to settle in Nephite territory (cf. Alma 27:21-22). ratification of the chief captain over the Nephite armies (see Alma 46:34) and granting him broad powers (cf. Alma 51:15-16). Nothing terribly new here; this has all been discussed many times by better scholars. But here’s my point: how often in all this — or, for that matter, through the entire Book of Mormon history — does God intervene to ensure that a particular leader is chosen? To be a touch more accurate, there are a few instances when God chooses a leader — Lehi, Nephi, Mosiah1 — but those are in critical (and rare) circumstances where people must choose to follow that leader physically out of the current civilization and into wilderness. There are no cases where God Himself takes a hand in changing who ends up being the leader in a ‘voice of the people’ setting, or even in a monarchy; remember that Mosiah2 dissolved the monarchy precisely because of the risk of ending up with a ‘wicked king’, as happened with Zeniff’s son and successor, Noah (cf. Mosiah 29:16-25). One of the dominant themes of the Book of Mormon is agency and its consequences, and that is applied to government as well, whether it be monarchy or judgeship. We are accountable for the government (and leaders) we choose and the results thereof; we cannot attribute the outcome to the Lord, only to ourselves. Something to remember, whatever the results of tomorrow’s election here in the United States. ..bruce.. The real reason Lehi and his party took eight years to get to Bountiful. Stolen from Facebook; feel free to steal it from me. ..bruce..
Longer Book of Mormon quotes here, as for the entire series, are taken from The Book of Mormon: The Earliest Text (Royal Skousen, ed. ), though links will be to the modern version. That would seem to be a good place to end the first book and start the second one — new land, new book — but Nephi adds two more chapters, bringing the total up to seven, a doubly-significant number: not just because of the perfection and completeness of the number “7” in Jewish symbolism, but because (and possibly for the same symbolic reason) Lehi’s descendants will be divided into seven tribes throughout the history of the Book of Mormon. Now it came to pass that I Nephi did teach my brethren these things. in other lands among people of old. And I did read many things unto them which were in the books of Moses. that it might be for our profit and learning. and they testify that a man must be obedient to the commandments of God. which have testified and also taught them. ye shall be saved at the last day. Nephi introduces for the first time (in the record we have, at least) the phrase “endure to the end”, a phrase that appears repeatedly throughout the Book of Mormon (Moroni2 quotes it near the end of his own book, a thousand years later), and which Latter-day Saints have adopted as the “fifth” principle and ordinance of the Gospel (cf. here). Here, though, there is a personal poignancy to its use. Nephi is writing upon these plates after he and those who followed him are forced to flee into the wilderness yet again, not just dividing Lehi’s family but dealing with the threat of having his older brothers “come upon us and destroy us“. S. Kent Brown, specifically addressing the issue of Nephi including two chapters of Isaiah within First Nephi, feels that — beyond Nephi’s attempt to show fulfillment of prophecy — it also was of emotional comfort to Nephi in the light of just how difficult the journey to the promised land was, the sense of being vastly removed from all they knew and loved back at Jerusalem, and the irreparable damage done to Lehi’s family structure. With these two chapters, Nephi finishes his first book on the small plates, tracing his history — in parallel to his father Lehi’s — from Jerusalem to the shores of the promised land. He likewise traces his own personal arc from the youngest brother (at the time) to a true prophet and potential leader over this group of exiles. But he knows things are going to take a turn for the worse — he is writing all this after the flight from Laman and Lemuel — and he saves that for his next book. Next post: Second Nephi, title and introduction. ..bruce..
 “What is Isaiah Doing in First Nephi? Or, How Did Lehi’s Family Fare so Far From Home”, Chapter 2, From Jerusalem to Zarahemla, S. Kent Brown, Religious Studies Center, Brigham Young University, Provo, UT, 1998. While working on the “Parsing Nephi” series, which is an analysis of the chapter structure of the original Book of Mormon manuscripts (scribal and printer), based on Royal Skousen’s work on the Book of Mormon critical text, I was struck by the organization of extended or parallel quotations from the Old and New Testament within the Book of Mormon text. Nephi quotes two chapters of Isaiah in First Nephi. In Second Nephi, Jacob quotes two chapters of Isaiah (with the first two verses from a third), after which Nephi quotes thirteen more chapters of Isaiah, then later gives an interpretive reading of yet another one. Similarly, when the Savior appears to the Nephites after His resurrection, He gives a sermon that closely parallels the Sermon on the Mount found in Matthew 5-7, then later quotes one chapter out of Isaiah and two chapters out of Malachi. Critics (and even some supporters) of the Book of Mormon often claim that Joseph Smith simply copied (or read out loud to his scribes) chapters from the King James Version into the Book of Mormon manuscript. However, there is no historical or physical manuscript evidence of that happening (all credible historical evidence is, in fact, to the contrary); beyond that, there are meaningful textual variants from the KJV in most of the chapters quoted. In the modern (1879 and later) LDS editions of the Book of Mormon, the Book of Mormon chapter divisions always correspond on a one-to-one basis to the King James Version chapter divisions (with the exception of tacking Isaiah 52:1-2 onto the end of Isaiah 51). This admittedly does lend itself to the appearance of direct copying. Mosiah VII: King Noah begins his reign; Abinidi preaches before King Noah and his priests — the priests ask a question about Isaiah 52:7-10; Abinidi, in turns, asks them about the Ten Commandments (Exodus 20:1-17; also see Deuteronomy 5:6-14). 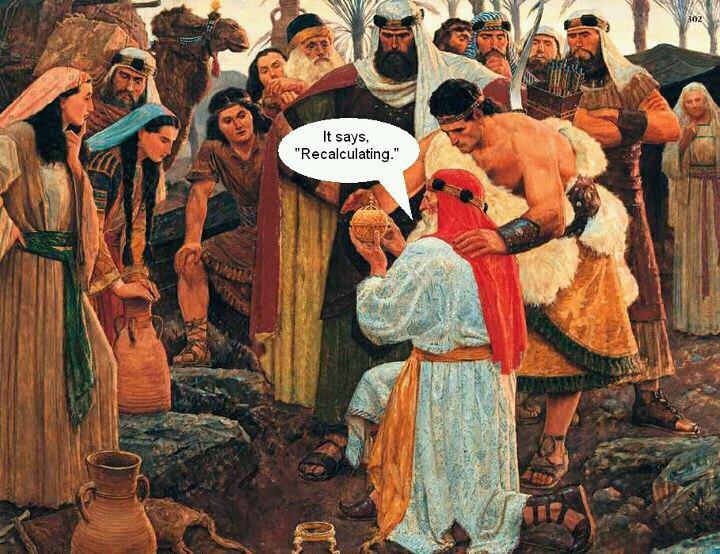 Third Nephi X: The Savior talks about His efforts to establish His Gospel among the Gentiles at the last day; He quotes Isaiah 54; and then He chides the people for the things they have failed to record in their own scriptures. Third Nephi XI: A brief introductory verse (3 Nephi 23:14); Malachi 3 and 4 (with more introductory text appended to the start of Malachi 3); and a follow-up description of the Savior expounding the scriptures (3 Nephi 26:1-5). In sum, the chapter divisions within the original Book of Mormon manuscripts and the 1830 edition provide no support for simple dictation from the King James Version and, if anything, argue against it. UPDATE [same day]: I couldn’t believe that I was the first person to make this observation, so I dropped a note to Royal Skousen, asking for prior references. He graciously replied and pointed me to his own article, “Textual Variants in the Isaiah Quotations in the Book of Mormon”, found on pages 369-390 of Isaiah in the Book of Mormon (Perry & Welch, eds., FARMS, 1998). Specifically, his “Third Finding” on pages 378-379 is that “The original Book of Mormon chapter divisions of the Isaiah quotations follow a larger thematic grouping, not the interruptive chapter system found in the King James Bible.” He makes the same general observations and has a table that corresponds to the bullet list above for First and Second Nephi. “Isaiah in the Bible and the Book of Mormon”, John A. Tvedtnes, FARMS Review: Volume – 16, Issue – 2 (2004), Pages: 161-72. As mentioned previously, Nephi makes a couple of references about these (small) plates discussing his “reign and ministry”. Last week, we saw what appeared to be the start of Nephi’s ministry; this week, we’ll see the start of Nephi’s reign, though perhaps a more modest “reign” than we might imagine. I’ll note here that while Nephi says he is writing about his “reign”, he seem very uncomfortable with the title of “king” (cf. 2 Nephi 5:18), probably because of his readings in the brass plates (cf. 1 Samuel 8:4-9). First Nephi IV was a relatively short chapter, both in length and in chronology, most of which was about Nephi acting as a prophet and spiritual leader to his brothers, largely in the space of two conversations. By contrast, First Nephi V is quite a long chapter. It covers nearly eight years of time and most of their journey, from the time that Lehi’s party leaves their first camp in the valley of Lemuel until they arrive in the Americas. It comprises a series of set pieces underscoring Nephi’s growing leadership of this group, as his brothers rebel and even his father falters, both spiritually and physically. More than anything else, Chapter V is about Nephi setting forth parallels with the story of Moses leading Israel across water and through wilderness to the promised land, with Nephi largely in the role of Moses. This is, of course, a long-established observation about Nephi’s writings, and one that has been covered repeatedly by better and more knowledgeable scholars than I. What is interesting, though, is to see how much of this is packed into a single chapter, namely this one. “The Voice of Murmuring in the Wildnerness”: not just the act of murmuring itself, but also that a specific instance was tied to lack of food, which was subsequently provided with divine help. “Reasonable Fears and Foolish Desires”: the respective wandering groups fearing death in the wilderness and wishing to return to their prior lives — even though it meant slavery in Egypt and death or captivity back in Jerusalem. “The Liahona and the Serpent”: in both cases, a bronze object that yielded miraculous results, yet that at times was ignored “because of the simpleness of the way” of using it. “High on a Mountaintop”: Moses ascending Sinai, and Nephi ascending the mountain at Bountiful, both times to receive divine instructions on leading their respective parties, and in particular detailed instructions on constructing a physical object (the ship and the Tabernacle) that would be essential to the group’s on-going progress. “Nephi’s Powerful Sermon”: both Nephi and Moses coming down from the mountaintop encounter with God with great power, such that the members of their respective parties feared to approach them. “Two Parties, Too Wild”: the celebrations and orgies surrounding the golden calf, and the dancing and singing “with much rudeness” on board the ship, with the threat of divine destruction and death following each. Finally, here are a few additional thoughts of my own. The brass ball, or compass, is the third of three tangible objects (the others being Laban’s sword and the brass plates) that will be a source of contention between the Nephites and Lamanites and that likely will lead to the Lamanite traditions of the Nephites being robbers (cf. Alma 20:13). Unlike the first two, however, it was not taken from Jerusalem but miraculously appears outside Lehi’s tent and marks the start of the rest of the journey. Indeed, it appears that it was essential for that journey and may well have come in answer to Lehi’s prayer as to where to go next. While Tzink rightly compares the brass ball to the brazen serpent, I think there is also a valid comparison to be made between the ball and the stone tablets containing the Decalogue. Both have miraculous writing direct from God, though that on the ball changes “from time to time” (1 Nephi 16:29). And in both cases, the artifact travels with the party and remains as a memorial of the time in the wilderness. When the food crisis hits, and even Lehi murmurs, Nephi asks his father to seek guidance from the Lord; part of that comes via the ball, and Nephi follows those directions to find food. On the ocean voyage, when Nephi is bound, the compass “did cease to work”; Lehi, by implication, is unable to make it work, though it sounds as though Lehi may have been incapacitated by a combination of old age and seasickness. It is only after Nephi is freed that the compass once again works. The big difference, of course, is that the ball — unlike the stone tablets containing the Decalogue — is not gained by ascent to a mountain where God’s presence resides; instead, it appears outside Lehi’s tent one morning. However, that in itself is still miraculous, since the ball was “of curious workmanship” and “of fine brass”, and yet there were no facilities for making such a device there in the wilderness; note that when Nephi breaks his steel bow, he is forced to craft a new one from wood. It is not until Lehi’s party reaches Bountiful several years later that Nephi is able to find and refine some iron ore for tools. And it came to pass that we did again take our journey [from Nahom] in the wilderness. And we did travel nearly eastward from that time forth. and our women bare children in the wilderness. yea, even like unto the men. And they began to bear their journeyings without murmuring. yea, even eight years in the wilderness. Just as Deuteronomy notes that it’s only an eleven-day journey from Horeb to Kadesh-Barnea, an examination of a map shows that the distance from the apparent location of Nahom to any of the proposed locations for Bountiful is on the order of 700 miles (with the total trip from Jerusalem to Bountiful being on the order of 2000 miles). Even at a modest 8 to 10 miles/day, that’s only about three months’ worth of travel to cover 700 miles, yet it took Lehi and his party something approaching eight (8) years to make it to Bountiful (Nephi’s comment above leaves it unclear as to whether the “eight years” is the time from leaving Jerusalem, from leaving the valley of Lemuel, or from leaving Nahom). they were slothful and forgat to exercise their faith and diligence. and they did not progress in their journey. and were afflicted with hunger and thirst because of their transgression. It could be that Alma2 is referring to the “broken bow” incident that Nephi chronicles in this chapter, but he seems to be describing something more significant than that. My suspicion is that the (lost) book of Lehi contained a lot more details about the journey to Bountiful, particularly from Nahom to Bountiful. As noted above, Nephi covers that part of the trip in just a few lines. S. Kent Brown makes a credible argument that Lehi and his party may have passed much of that time in servitude to a local tribe somewhere in that wilderness in exchange for food and/or protection. If that is the case, then Nephi may have avoided discussing that directly, since it would undermine the Exodus parallels to have Lehi’s party going into slavery (as it were) rather than escaping from it. While Tzink notes the parallels between Moses parting the Red/Reed Sea and Nephi leading his family over the intervening ocean via ship, I believe there is another parallel as well, namely that of the children of Israel crossing the Jordan River into the promised land. In both cases, the Lord promises blessings to those who keep His commandments and cursings to the point of destruction for those who do not. that they would remember the Lord their Redeemer. if it so be that they should obtain these things. for they which are at Jerusalem. for he surely did shew unto prophets of old all things concerning them. for they are written upon the plates of brass. Next post: Nephi starts quoting Isaiah. “Sojourn, Dwell, and Stay: Terms of Servitude”, Chapter 4 in From Jerusalem to Zarahemla, S. Kent Brown (Religious Studies Center, BYU, 1998). Since the Book of Mormon is the topic of study this year, I thought I would list here Book of Mormon-related posts I’ve made over the past four+ years, in hopes that some find them useful in studies or teaching. Some of these posts — specifically, the “Parsing Nephi” and “Book of Mormon REPO Atlas” — represent works in progress (though in the latter case, something I haven’t worked on for a few years; got to get back to that). I will add links as I continue to write Book of Mormon-related posts and have created a separate page for this as well. I also reserve the right to go back and edit the posts, both for grammatical reasons and to reflect subsequent thoughts I might have on the subject. Comments, as always, are welcome. ..bruce..
Pre-Columbian shipping between South American and Mexico? Church/state tension in Jacob 1-3?